Tesla will become the world's No. 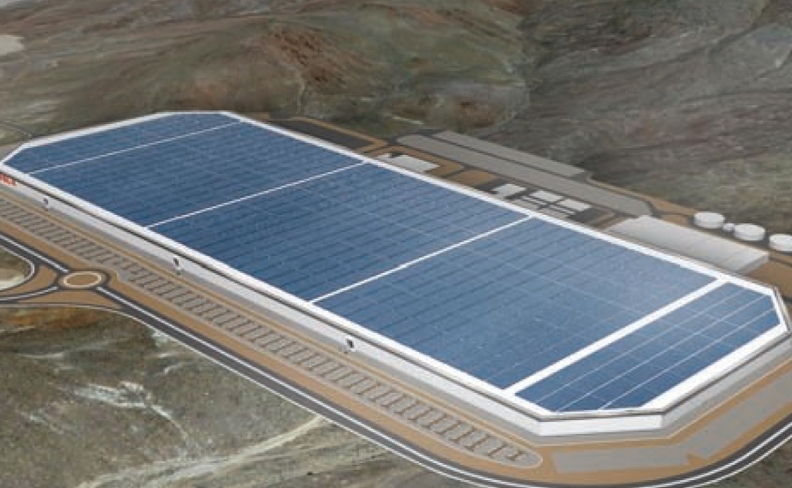 2 battery maker once it finishes building its $5 billion, 35 gigawatt-hour Gigafactory in Nevada, pictured. BERLIN -- German executives are preparing to announce a home for a lithium ion battery plant designed to rival the output at Tesla's Gigafactory. Terra E Holding will choose one of five candidate sites in Germany or a neighboring country next month to build its 34 gigawatt-hour battery factory, Frankfurt-based CEO Holger Gritzka said in an interview. The former ThyssenKrupp manager has helped to assemble a consortium of 17 German companies and won government support for the project, which will break ground in the fourth quarter of 2019 and reach full capacity in 2028, he said. The battery factory is the latest sign that German industry, the engine behind the world's fourth-biggest economy, is gearing up for a new stage in the energy revolution. Lithium ion batteries can help stabilize intermittent flows of wind and solar power on electricity networks. They're also projected to power millions of plug-in cars expected to roll off German production lines beginning early next decade. "We have to be better in process technology than competitors, a constant step ahead," said Gritzka, who emphasized that Terra E will be counting on Germany's competitive edge in manufacturing robotics and automated production to make money. Global battery-making capacity is set to more than double by 2021, reaching 278 gigawatt-hours, up from about 103 gigawatt-hours in the second quarter, according to Bloomberg New Energy Finance. Asia electronics makers including South Korea's LG. and Samsung SDI currently control the market. Tesla will become the world's No. 2 battery maker once it finishes building its $5 billion, 35 gigawatt-hour Gigafactory in Nevada, according to the London-based researcher. Some of Terra E's consortium members also may become its clients, according to Gritzka, who declined to name companies participating. The project, which won 5.2 million euros ($6.2 million) in subsidies from Germany's Ministry of Education and Research, expects to need upwards of a billion euros before completion, the CEO said. Terra E will be seeking strategic investors that are attracted by the government-paid research embedded in Terra's technology and Chancellor Angela Merkel's endorsement of the company, said Gritzka. In May, Merkel broke ground at another 500-million-euro plant to assemble lithium ion energy-storage units for Daimler. Terra E will focus its batteries on stationary units, Gritzka said. The project aims to tap an emerging market for mobile and non-automotive power and storage, said Gritzka. The bet rests on projected faster demand for lithium storage in the next decade.